CHATILLON, France (ONERA PR) — The ALTAIR project (Air Launch space Transportation using an Automated aircraft and an Innovative Rocket) is a European Horizon 2020 project coordinated by ONERA and involving partners from six countries. The goal is to demonstrate the industrial feasibility of a low‐cost launching system for small satellites. This research program will last 36 months. This launcher will use an environmentally friendly hybrid propulsion, advanced lightweight composite structures, innovative avionics and an upper stage providing mission versatility. The architecture of the ground systems will target cost‐effective operations. The system design will involve multidisciplinary design/optimisation methods (MDO), which ONERA has developed for over ten years. The output of the project will be a detailed definition of the complete system (carrier, launcher and ground segment), associated with a business plan as well as a development road map and an industrial organization proposal. In addition to system design work, flight tests will be conducted with the existing Eole demonstrator (developed under ONERA’s project management for the CNES PERSEUS project), in order to validate key technologies, including the launcher avionics and its release sequence. ONERA’s partners for the ALTAIR project are: Bertin Technologies (France), Piaggio Aerospace (Italy), GTD Sistemas de Información S.A. (Spain), the Swiss Federal Institute of Technology Zurich (Switzerland), NAMMO Raufoss AS (Norway), SpaceTec Partners (Belgium) and CNES (France). I think you are misconstruing the engine placements as asymmetric. It certainly looks asymmetric to me too. It looks like English industry design. 😀 But it is said to be Norwegian. I agree, it looks asymmetric, but is it really? Or is it just a bad graphic? Regardless, twins fly asymmetrically all the time. I think the asymmetric appearance is an optical illusion caused by the engine pylons being tilted forward. that causes the engines to appear shifted to the right (in the picture, so left side of the aircraft). If you look closely, the distance between the pylons and the the center of the wing (pointy nose) is exactly the same. @ the concept: that looks an awful lot like Virgin Galactic, and they even plan to use a hybrid engine (why?!?!). Not sure why they call that an “innovative design” (maybe in 2004 it was innovative…). I just posted a possible explanation above while you were typing: I’m pretty sure that design is not asymmetric. But the reflection on the floor shows that one of the engines is (close to) straight above the red rocket. The other engine is obviously asymmetric in relation to that. Anyway a bad illustration. Some perspective settings in the rendering software or something was not right here. And that puts doubts in my mind about how serious this is. If at the end of this 3 year study they actually decide to build this system, it’s going to be entering a crowded marketplace. I have a hard time believing the market can support so many smallsat launcher companies. There’s bound to be a shakeout within a few years. I think ‘indigenous capabilities’ is the key phrase here. And you can’t deny it’s a great design that avoids some of the pitfalls of previous attempts, for instance, crews, and giant expensive aircraft. It’s an illusion based on the angle of the render. 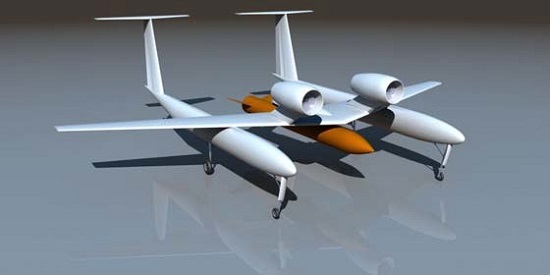 The demonstrator aircraft has engines in the same position and it is not asymmetric. The aircraft design is interesting. Developing a control system for a UAV is a non-trivial engineering exercise but it’s a known problem. Aircraft tend to have no more engines than necessary. WhiteKnightOne, for example, only had two engines. WhiteKnightTwo has 4 engines but it’s a much larger aircraft carrying a heavier load. As for the rocket, the article mentions it will have a hybrid engine burning an environmentally clean propellant. As in anything, that has pros and cons. As Virgin Galactic has learned, hybrid engine development can be tricky. A solid-fueled rocket is simpler (not necessarily cheap, though) while a liquid-fueled rocket has higher performance but also high development costs unless there’s an off-the-shelf engine available. The most disappointing aspect of the study is that it addresses the easiest aspect of the space launch problem (i.e. a high altitude launch platform) but does nothing to address the most important one (i.e. a fully reusable rocket). Given this lack of ambition, I see this as yet another study to spend government money keeping engineers employed; the press release certainly ticks all the right boxes to support this (e.g. environmentally friendly hybrid propulsion). I also note that they aim to produce a business plan but expect this may well begin with “Assuming sufficient government funding…”. Least innovative launch vehicle design since SLS. Yes, looking at it carefully I see that it is an illusion of the illustration. But I also agree, it doesn’t look like something done by a professional illustrator. Oh, a feasibility study. How terrestrial. I’m always leery of launch concepts which start out with “build a really large, one off, aircraft as a first stage”. The development costs for the aircraft portion are not going to be small. This is followed by the operational costs for the storage and maintenance of the same large aircraft which might be used a few times each year. This does not sound like a recipe for lower launch costs. In 1974 (ancient and forgotten history I guess…) with the primitive technology of the era the USAF proved by actual demonstration you could launch an ELV by dropping a Minuteman III out of a C-5. Seems to me it will work today with a smaller launch vehicle dropped from a smaller aircraft instead of building a special use drone. There are a number of aircraft with air drop capabilities to select from. So building a unique aircraft seems like a huge waste of time.